Mile after mile of toll road – 51 to be exact – none of them leading to London but all of them apparently there for a purpose! We can still trace the route from what was left behind. 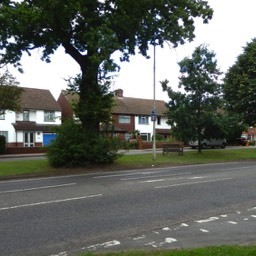 Today, the blue route is St Albans Road, Hatfield Road and St Stephen's Hill. 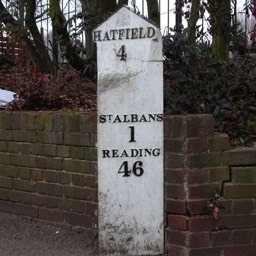 Volume 1 of St Albans' Own East End detailed the location of the mile markers along the eastern arm of the Reading & Hatfield Turnpike, from the former Old Fiddle PH to St Albans. 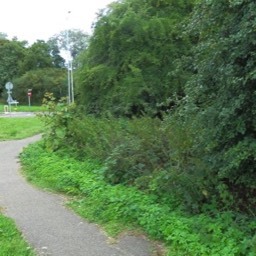 All of the markers, five in total, still line the road at Ellenbrook (1 mile from the former Old Fiddle PH); at Popefield Farm, bar Smallford Lane; Oaklands, near Colney Heath Lane; Fleetville; and near the Peacock PH. Between the Peacock and the Duke of Marlborough PH at the foot of Holywell Hill, the road had been maintained by the parish or the town, and so no tolls were payable. However, this is not a page about toll points. 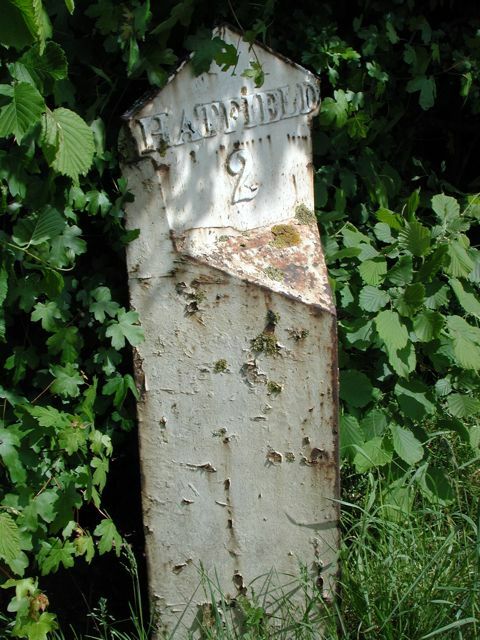 Although stated that all the markers remain in position, that is not strictly true, for the Fleetville marker began life roughly halfway along where Bycullah Terrace (between Woodstock Road south and Arthur Road) is these days, but was, of course, had previously been open country. According to the 1898 OS map and the 1912 reprint based on 1898, the marker was still here, sited in front of one of the Bycullah shops. 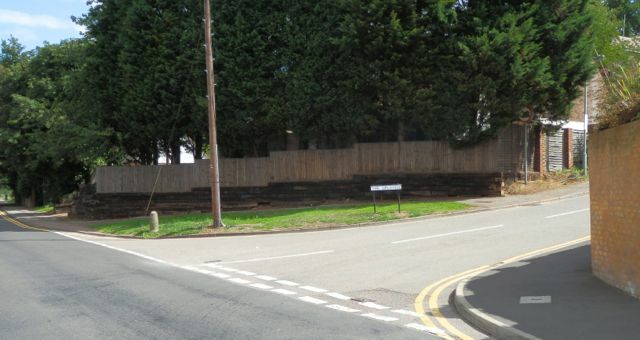 Surveys undertaken in 1924 and 1937 do not show the marker anywhere; however, at some point after the Second World War the marker was found and replaced a little further along the road at the corner of Royal Road and the Recreation Ground. 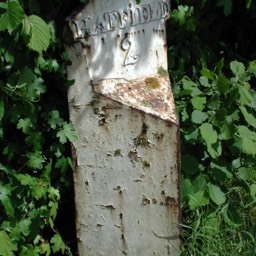 In spite of building development along the line of the road the Fleetville and Peacock markers have survived building operations. 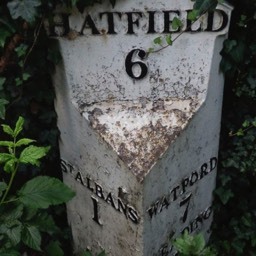 By contrast, only one of the markers between St Albans and Watford remains. So, let us deal first with this solitary remaining marker, which is sited in St Stephen's Hill, one mile from the Peacock PH. All of those east of St Albans are on the north side of the road. 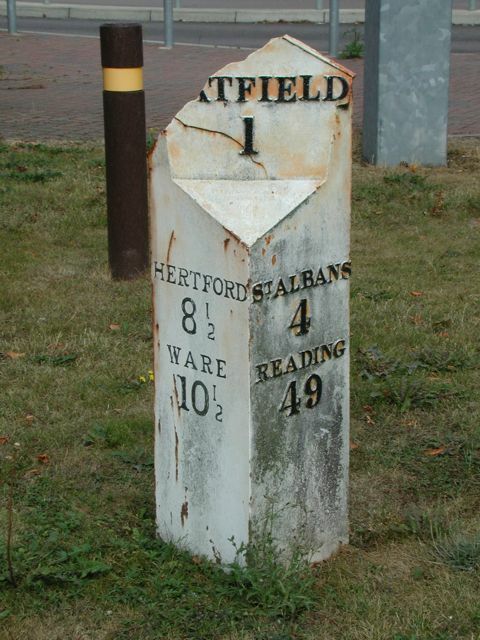 It is clear from the distance information that either the St Stephen's Hill marker was originally on the west side (on the right when travelling towards Reading – or more locally, Watford). Or that it was intended to be installed on the west side. The earliest OS map available which shows mile posts or stones, was published in 1883, from surveys probably made one or two years previously. This would man the survey being undertaken at roughly the time the turnpike road was taken over by the Highways Board. The map shows the marker to be on the east side of the road then, as now. It must therefore be assumed that it had always been on that side of the road. 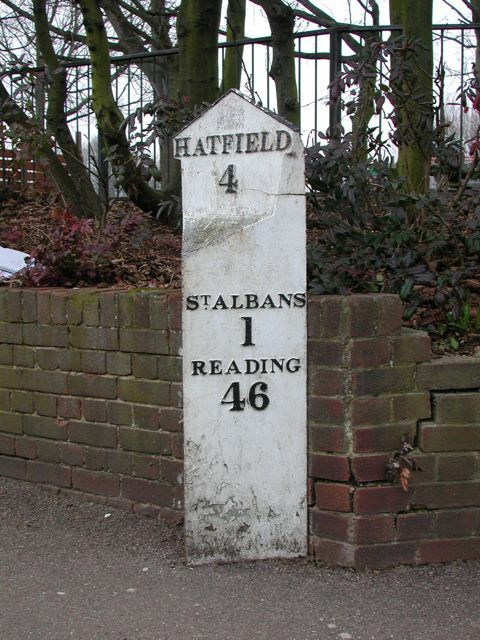 But when the information is inspected the fact on the St Albans' side announces that it is one mile to St Albans – since a traveller has just come from there that detail is superfluous. 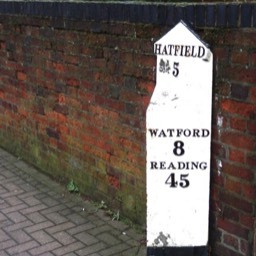 The face on the Watford side states a distance of 7 miles to Watford and 44 to Reading. If the marker had been intended for this side of the road the information on the two faces would have been reversed. Looking across to the west side it is clear that the placing of the marker would have been difficult, given the cliff-like embankment on that side of the road. 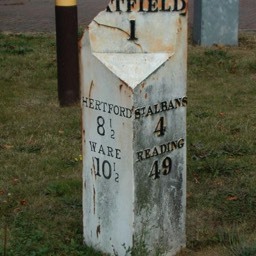 As we shall see shortly, the other markers between St Albans and Watford were also on the east side. Since they no longer exist we can only speculate whether they too had reversed details. 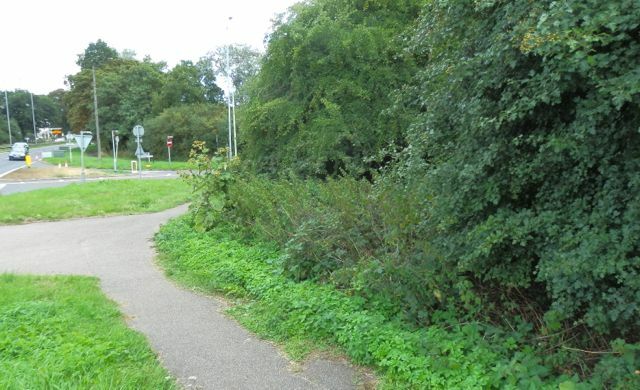 If so, we must probably assume the Turnpike Trust intended all of the markers would be placed on the nearside (left) for travellers from Reading. 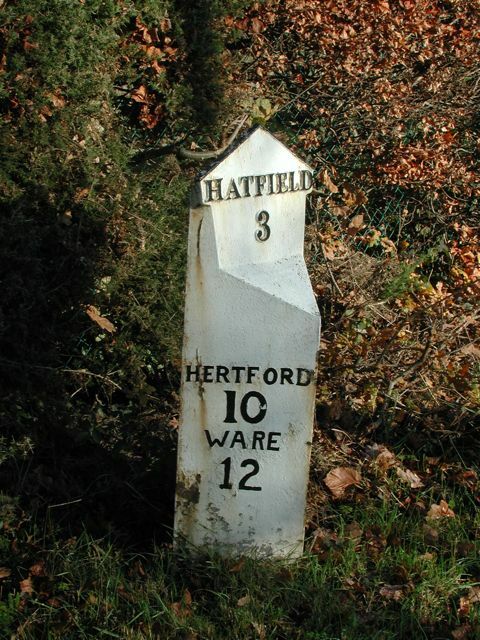 The route was always known as the Reading & Hatfield Turnpike; the main Trust office being in Reading, and the markers were all cast in that town. 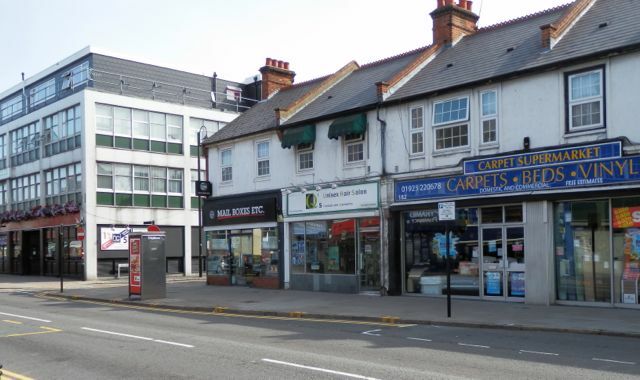 While the reason for mis-location in St Stephen's Hill is explainable, all of the others were on reasonably level ground. It is possible that a difference of opinion with the riparian land owner on the west side may have resulted in placement on the opposite side of the road in certain circumstances. But by the, the markers, with their distance information, had already been cast. 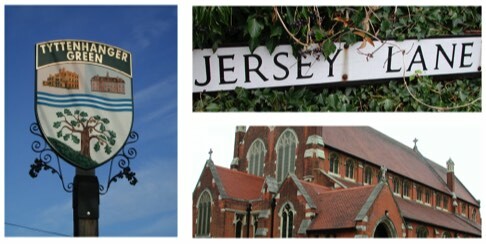 All of the extant markers are identified in Historic England's National List vas Grade 2 structures. St Stephen's Hill, east side. 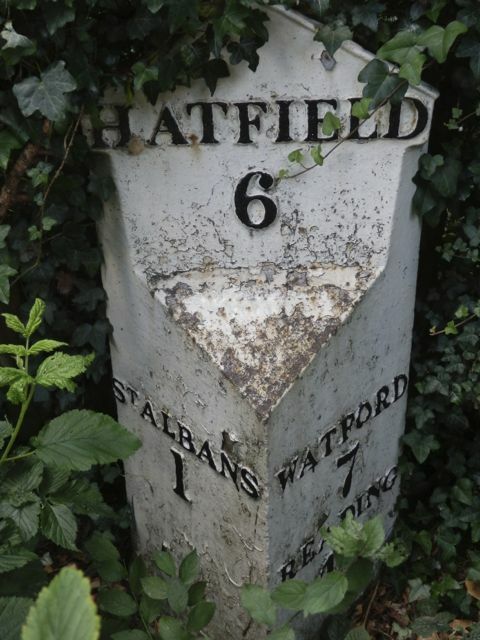 St Albans 1, Watford 7. Extant. Near Tippendale Lane, west side. St Albans 2, Watford 6. 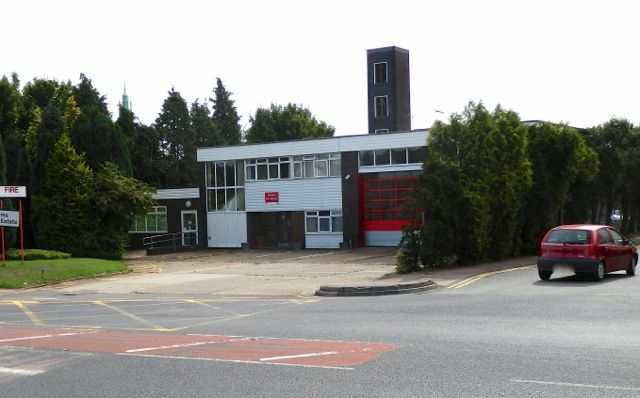 Approximately 200 yards north of Chiswell Green Lane. Shown on the OS 1939 map. Possibly removed when adjacent homes were constructed in the 1950s. Whereabouts unknown. Near Lye Lane, east side. St Albans 3, Watford 5. Immediately south of the Lye Lane/ Noke Lane crossroads. The OS 1898 shows it on the east side, but the 1935 map has it on the west side. There have been gradual improvements to width of the highway and its position may therefore have been changed. Last appears on the OS 1939 map. Present whereabouts unknown. Waterdale east side. St Albans 4, Watford 4. 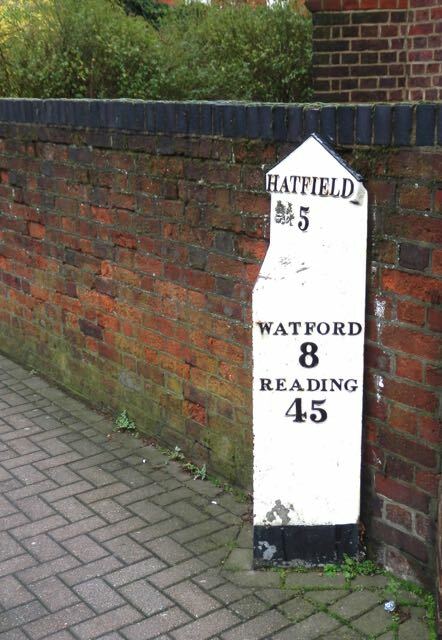 The existing road to Watford was the Old Watford Road, passing the Black Boy PH toll point. The position of the marker was close to the modern road called The Uplands. Last appears on the OS 1939 map; present whereabouts unknown. Horseshoe Lane, east side. St Albans 5, Watford 3. 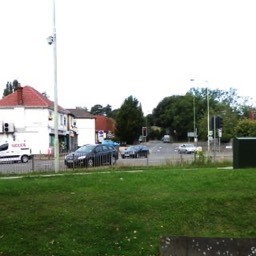 East side opposite a T junction Horseshoe Lane/St Albans Road leading to Garston. Kingsway did not then exist. Last appeared on the OS 1939 map since when it had been moved to the west side close to Dean Court, Kingsway. Present whereabouts unknown. Lea Farm, east side. St Albans 6, Watford 2. 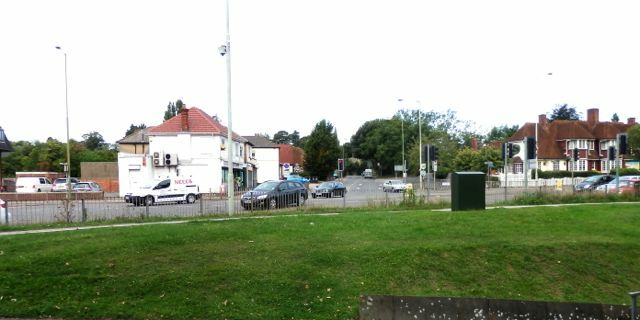 This was once a triangular junction (the triangle is now the large Dome Roundabout) with a small road leading past the former Lea Farm, where Sainsbury's is today. Shown on the 1871, 1898 and 1914 maps, by the time the 1939 map was printed the arterial Northwestern Avenue had been laid and the first roundabout constructed. 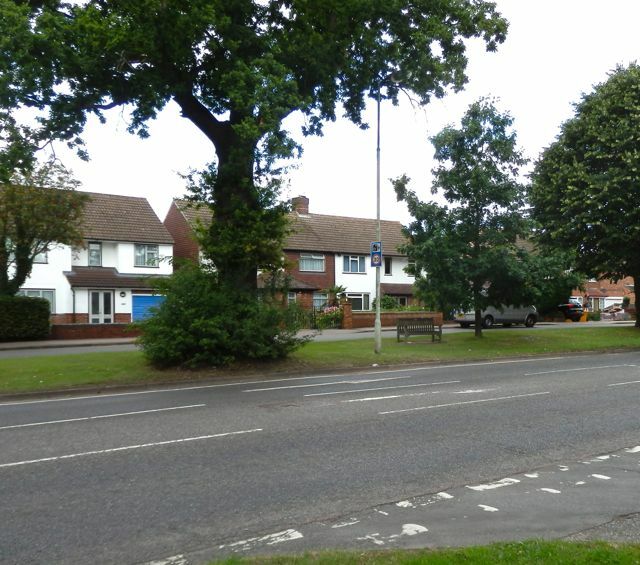 The mile marker had been moved to a point on the Garson side of St Albans Road, on the grass verge where the 30mph sign is today. Current whereabouts unknown. Callowland, east side. St Albans 7, Watford 1. 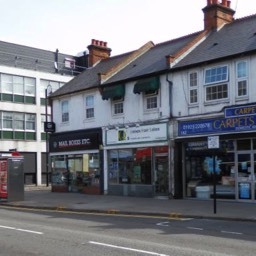 Located in St Albans Road, roughly where Carpet Supermarket and Mailboxes Etc are today, just south of Salisbury Road and midway between Regent Street and Victoria Road opposite. It is not shown on the 1871 map, but when the 1898 map was published the west side of the road was partly developed. The roads were laid out and some homes built. The east side was still fields, though, and the marker was still in position. By 1914 east side development was complete and the mile marker still in place, but was removed at some point between then and 1939. Current whereabouts unknown. We now return to the question: why have all the markers east of St Albans survived, when the rest, other than St Stephen's Hill, have not? 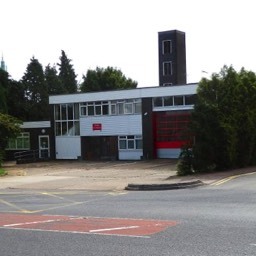 St Stephen's Hill was within the city, but beyond there was the responsibility of St Stephen's parish, St Albans Rural and Watford authorities. 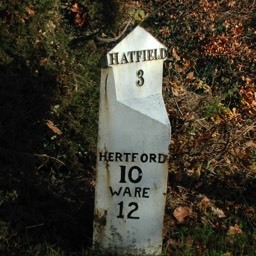 The three Watford markers described all disappeared earlier. Finally, it should be considered that most of the markers were last seen on the 1939 map. It is probable that most of the councils felt it prudent to remove the markers at the start of the war. It was a defensive tactic in the event of evasion, and to confuse enemy agents who might enter the country by parachute. At the end of hostilities the authorities neglected to replace them. So, what happened to the missing markers? Where were they taken? Do they still exist somewhere? A suggestion, and possible answer, was provided by milestones' specialist Michael Knight, who considered that the easiest option in 1939 would have been to dig a trench next to each milestone, tip it into the hole – and bury it!. Six years later no-one in authority would have thought to retrieve and reset them. Well, that theory has yet to be tested. 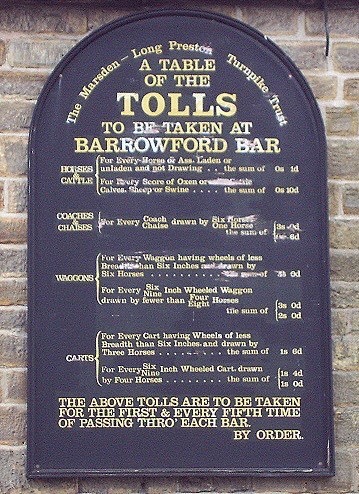 We only have visual evidence of two toll houses. 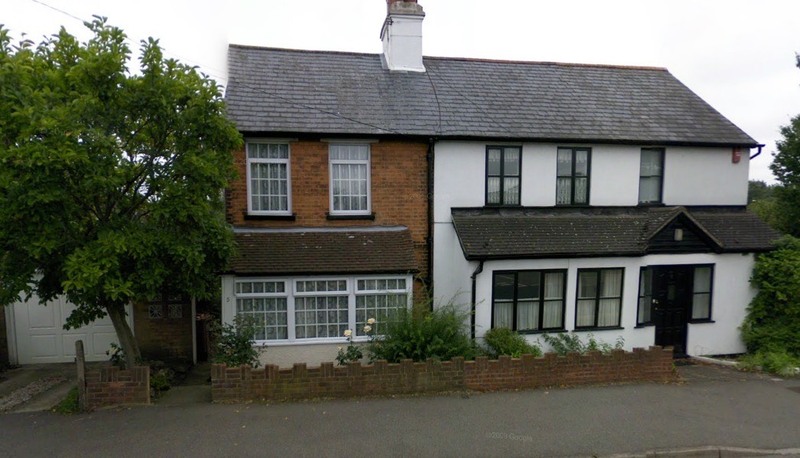 Above is the former house at Smallford cross roads, by far the finest structure. 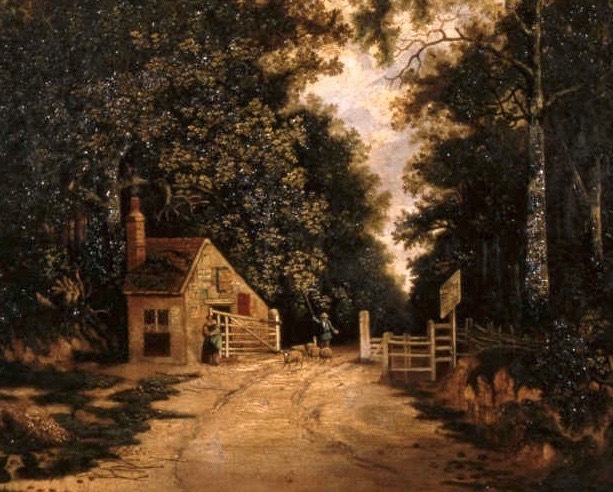 Below is a painting of the Hut Toll at the entrance of Colney Heath Lane from Hatfield Road. 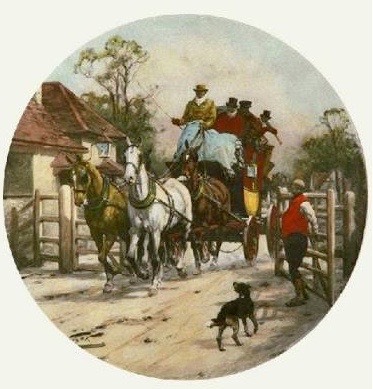 Painting by John Westall. Courtesy St Albans Museums. 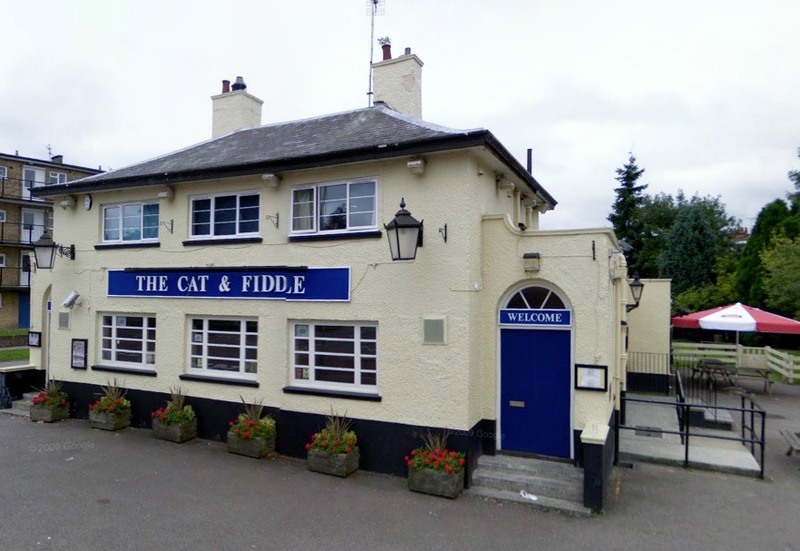 The New Fiddle, later renamed Cat & Fiddle, stood at the junction of Roe Green Lane and St Albans Road. An Act of Parliament for this road is dated 1768. 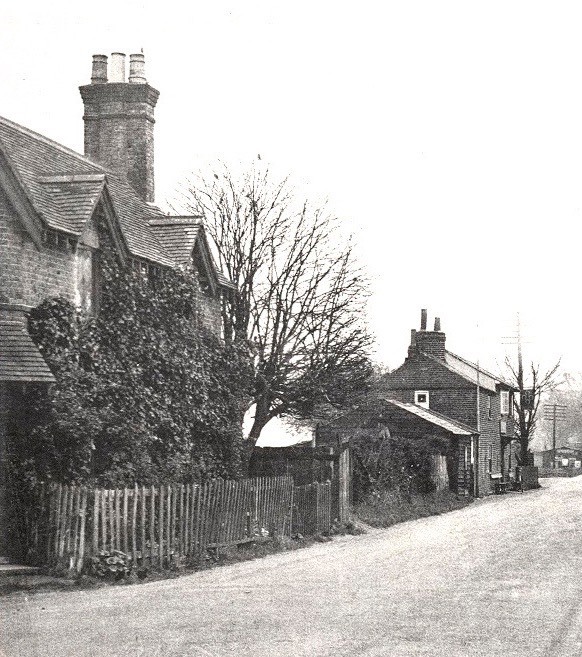 The toll road was intended to branch from the Great North Road at the Fiddle PH (later Old Fiddle) in Roe Green Lane. 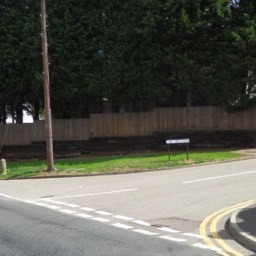 An early route may have used Ellenbrook Lane to reach St Albans Road. 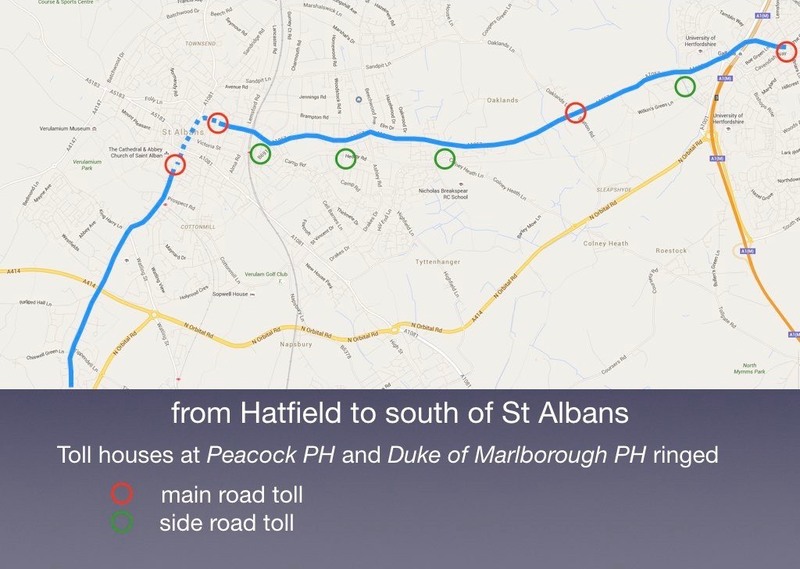 Later the route began at the New Fiddle PH and remained on St Albans Road, avoiding Roe Green Lane and Ellenbrook Lane. This was the earliest starting point at the Fiddle PH (renamed Old Fiddle after the opening of the New Fiddle PH). Not much survives of the R&H Turnpike: bars, tariff boards, pictures, or even documents. The following three images are from other more fortunate turnpike survivals. 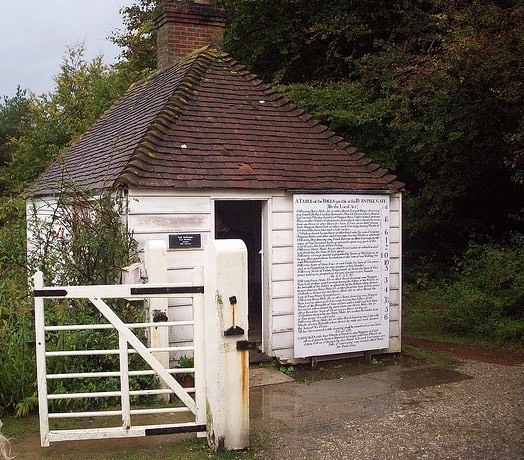 Wooden toll cottage from Beeding, Sussex, and now removed to Weald & Downland Open Air Museum. A scene possibly at Marlow, courtesy Archaeology in Marlow website; owner unknown. Between January 12th and 18th 1878, 1,866 carriages passed the toll at the Peaock PH, compared with 346 at the Pondyards toll. The survey took place in daylight hours. Highways Board survey prior to "de-maining" the turnpike.